Being an entrepreneur is hard. I have several things at once (yes, mistake) but I am moving forward. One of the key areas where I put a good amount of effort is creating Pluralsight trainings. And one of my trainings, where I put in a huge amount of work is “Getting Started with Enterprise Search Using Apache Solr”, which takes a dev with 0 experience in Solr and a bit of .Net and in 3.4 hours teaches him or her how to build a working POC style project with Solr and a .NET MVC UI. Getting to the point, Pluralsight recently acquired CodeSchool and to celebrate they opened their library for 72 hours for free. So I announced in a couple of Linkedin groups that the course on Solr will be free for this time in case they want to take advantage of the offer. Huge surprise did I get when I see a newsletter from Solr-Start (www.solr-start.com) announcing this. It turns out that Alexandre Rafalovitch, a well known Solr popularizer and author saw my notice and blasted off an email to his crowd. It feels great when a good author shares your news over a newsletter! I wouldn’t even asked him to do this but he did it on his own and for that I really have to thank him. 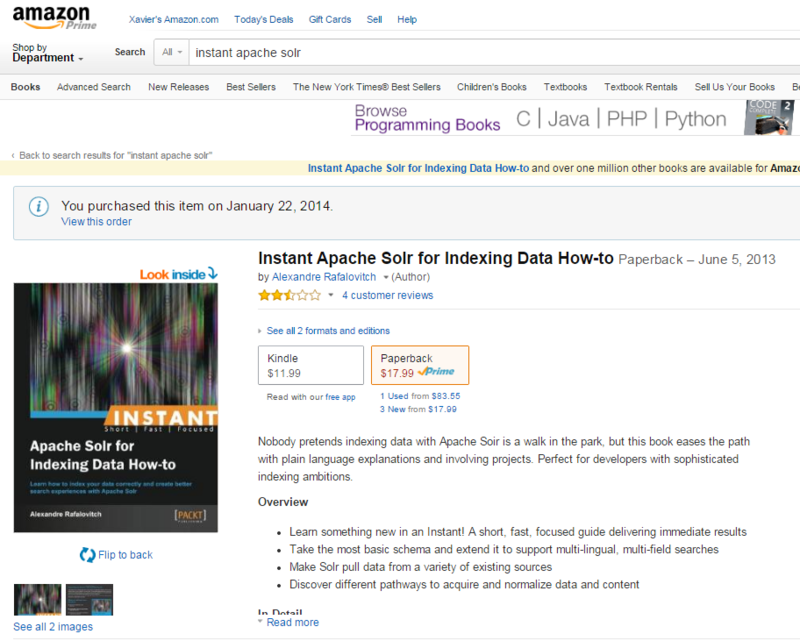 And by the way, if you are just getting started with Solr, his book Instant Apache Solr for Indexing Data How-to is an excellent resource that can help you understand how to index data. It has a lot of great tips and examples. I got it from amazon a while back and it has helped me greatly. 100% recommended! Or in Amazon.com, and as you can see I bought it 1 year ago.